Disney has pretty brilliantly found a way to capitalize on their classic movies by remaking them and presenting them in a new way for modern audiences. Live-action remakes of Cinderella, Alice in Wonderland, The Jungle Book and Beauty and the Beast have all crushed at the box office. 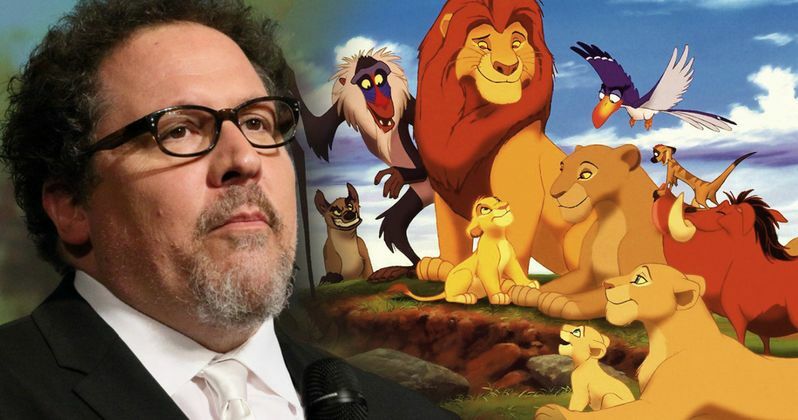 One of the next projects Disney will be tackling is a "reimagining" of The Lion King, which is to be directed by Jon Favreau, who also helmed the live-action Jungle Book. The movie hasn't started shooting yet, but he recently opened up about his approach to remaking the animated classic. During the Tribeca Film Festival, the 50-year-old director spoke on stage with Scarlett Johansson, who has worked with him frequently over the years. During the conversation, he was asked about his approach to directing The Lion King and how he is going to tackle remaking the beloved animated classic. Per Entertainment Weekly, here is what Jon Favreau had to say about it. "When you're directing, you have to love [what you're making]. You have to love it to the point of obsession. I have to live, breathe, sleep it, dream it. If I'm going to do my best work, I need to be completely immersed... you look at the material and you get inspired, and then try to update it for our time. With the Disney stuff, people know even more... With Lion King, people really know [the original], and they grew up with it and it has emotional impact. I think about what I remember about The Lion King? I did it with Jungle Book [too]. [I asked myself], 'What do I remember about [the 1967 version of] The Jungle Book? I remember Mowgli and the snake. I remember the snake's eyes. I remember Baloo going down the river and Mowgli riding on him like a raft. I made a big list, and those are the images we definitely needed... and you have more latitude to shift and change those things." Beauty and the Beast is probably close in terms of how much adoration fans have for it, but The Lion King is truly going to be a delicate thing. It is one of the highest-grossing movies of the 90s, having brought in a grand total of $968 million worldwide on a budget of just $48 million. That would be very impressive even now, but in 1994 that was truly rare air. But unlike The Jungle Book, which Jon Favreau did a very good job with, by most accounts, The original Lion King was much more recent and people have lived with it for more than two decades. That is something the director is very aware of heading into production. "The Jungle Book was 50 years ago, Lion King was 20, and people grew up with it in an age of video where they watched it over and over again. So, I have to really examine all of those plot points. Also, the myths are very strong in it, so you're hitting something even deeper than the movie sometimes. What I'm trying to do is honor what was there... There are certain expectations people have." Disney has not yet set a release date for The Lion King remake, but it will be using the same technology that used to bring the animals and surroundings to life in The Jungle Book. Donald Glover has already been cast in the role of Simba and James Earl Jones is coming back to provide the voice of Mufasa, as he did in the original 1994 movie. It is also being reported that Beyonce is the top choice to play the part of Nala, but she has not yet been confirmed.